I have conducted hundreds of assessments for companies and government agencies of all sizes over the past 20 years that we interested in document scanning. My consulting style is straightforward and direct, and my recommendations are always based on actual existing conditions as opposed to presumed processes. 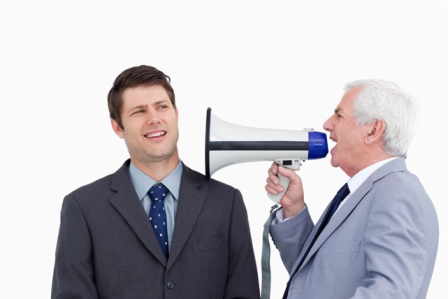 Although it’s not always easy to hear, most management and executive teams can quickly grasp the big picture of problem identification to resolution. They see it from a three dimensional perspective that includes operations, sales, compliance, and customer service. 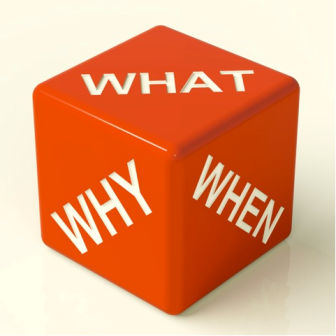 It is more efficient to gather those who may be vested in the results of a decision at the start of the process rather than trying to repeat and/or “sell” the concept later in the game and expending time and resources on “playing the procurement” game. One of the best pieces of advice I received early in my career came from a self-proclaimed dogmatic CFO who had an open disdain for sales; this guy could spin numbers faster than Rain Man. His response to my extensive document scanning ROI analysis was short, but definitely not sweet. He said, “Don’t ever try to sell a ROI to a numbers guy; you will always lose”. There’s no great ending to the story. They didn’t launch the document scanning project, and I didn’t have a slick comeback. His advice, however, made perfect sense. Line item document scanning ROI analyses look great when the hard cost components are equalized, but measuring soft costs associated with the benefits of technology, resource efficiencies (LEAN principles such as wasted human talent), or progress can be tricky. At the end of the day, some decisions are made because they make sense despite the balance sheet. For example, some organizations dismiss document scanning when compared to storing documents off-site. 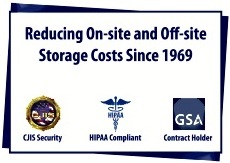 Why pay $100-$150 to scan a box of documents when it can be stored off-site for $6 a year? It could take 25 years to see a ROI on that expense, assuming the box is even kept that long. And in many cases, this is a solid argument. The problem with this scenario, however, is that the decision is typically made across the board for all documents, each having a unique set of criteria. Additionally, this scenario is supported by a list of assumptions. For example, this ROI assumes that the documents are never retrieved again (if so, there are costs associated with retrieval, transportation, and re-filing). It also assumes that the contents of each box have been documented and that someone is managing the retention to ensure the box is destroyed at some point. If not, then the yearly cost is infinite. Over time, a combination of loose policy and continued personnel turnover can result in significant off-site storage bills for thousands of boxes. Does anyone really know what’s in most of those boxes? It’s pretty amazing what we find when we do an off-site storage assessment. Un-labeled boxes filled with Christmas decorations, or boxes labeled “John’s right side drawer”. We once located a large volume of boxes that had been labeled “Not sure”. We can laugh about it now, but I can assure you that no one was laughing at the time! Even boxes that have descriptions are destined to live off-site forever because with all the publicity surrounding the destruction of documents; no one wants to pull the trigger to shred. There is also the litany of soft costs that, although very real, do not have predetermined values. For example, the cost to reproduce documents or information that may already exist is like paying a bill twice; we don’t know what we don’t know. The “simple math” storage cost comparison of document scanning versus off-site storage usually doesn’t include all the costs associated with managing paper: file folders; labels; boxes; storage equipment; labor to create and retrieve files; searching for missing files; interfiling documents; copy documents; or the physical space to store them before they go off-site. Depending on the values each organization might assign to the cost of managing paper, the ROI for document scanning can spin in a million directions. 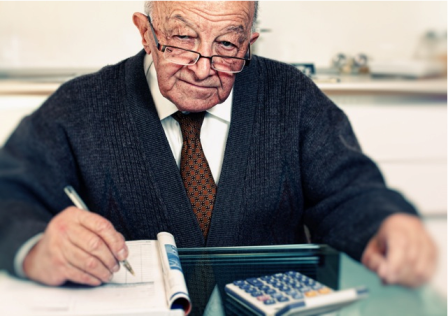 This type of analysis usually focuses on the financial impact of a proposed business decision, but that’s like comparing the cost of typewriters to computers. If we had the same approach back then, we would still be loading carbon paper. Now don’t go running off to scan everything in off-site storage! The sins of the past may be best handled in a different way. But you can stop the bleeding. At some point, there is a stage in the lifecycle when paper not only starts to lose its value, but also can actually cost more than you bargained for. Ultimately, there is an element of progress that will be difficult to quantify and yet will likely provide the most sound data towards the digital data imaging migration decision. Remember the typewriter analogy? The cost differential was vast and the benefits were not only uncertain, but also rarely utilized to their full potential. That still holds true today, but organizations nevertheless need to keep moving forward. Hopefully, we will do so having learned something along our technology journey. Forward progress isn’t taken in a single step; it’s a process. There is nothing more frustrating than someone trying to sell you something – regardless if you need it or not. Nothing infuriates me more than vendors who walk into a client’s office with a cute little portable scanner, a stack of paper, and a promise of life in digital Shangri-La! 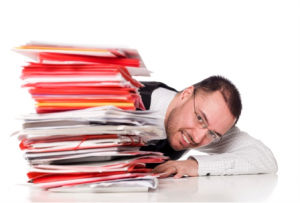 Document scanning isn’t about putting paper through a machine. It’s also not an “all or nothing” proposition. I visit with clients who have thousands of files that occupy miles of space and require scores of resources who have been lulled into thinking that the only way to stop the bleeding is to spend millions of dollars on document scanning. The result is that each year the paper grows and their perception of change only get more expensive. Migrating to the electronic document world can involve a lot of steps, but as someone once told me, I can guarantee you will never score if you don’t shoot! We don’t need enterprise wide spends to get started and quite frankly, it’s why so many organizations have been burned. The key is identifying a core document type or file set that brings you the best return (we’ll talk about ROI soon) and allows you to ease your way into the change. For example, you can start with scanning documents from your most recent year or perhaps consider core documents within a file that have a high retrieval rate. Maybe you have documents that are mission critical and the only copy you have is in paper format. The key to getting started with document scanning is not feeling the pressure to bang it all out at once but having a conversation about where it makes sense to start. We have clients that send us one box a week or sometimes just one box a month! At the end of the year, they’re 100,000 pages farther along than they were before or at least they haven’t added to the mountain they already have. With today’s advancements in technology and process efficiencies, there are few organizations that cannot afford to begin outsourcing this task. The options today are almost unlimited and creative approaches – not pre-determined solutions – should be the way we approach our options. Putting paper through a scanner is not rocket science. The key to success is understanding how those documents are being used, why those documents should (or in some cases, shouldn’t be) scanned, and making sure that whatever you do today will work as you progress into new technology applications and platforms. I’ll say it again – there is no one size fits all solution – but there are many document scanning solutions and the right one needs to be the one that works best for you. Anna Stratton is Director of Information Management Solutions at Southwest Solutions Group headquartered in Dallas, Texas. Anna specializes in records management and business process protocols, document scanning policy design, and information retention policies and process. Anna has over 18 years of professional business management experience and provides advice nationwide through the SYSTEC Group’s “Ask the Expert” column. Ms. Stratton is also a dynamic national speaker and conducts private corporate seminars on a variety of topics in addition to providing keynote and educational speeches for organizations such as ARMA and the Lorman Seminar Group. Ms. Stratton has been recognized by Cambridge Who’s Who for demonstrating dedication, leadership and excellence in information and asset management. I’m going to say what none of us want to admit; I like paper! Yes, I use my iPhone and iPad to manage almost every aspect of my life, and I love the ease of electronic transactions and mobility. I want to take part in the progress and the digital data imaging migration, but there are just some areas in my world where paper still works better than electronic documents. I know how to find it (yes, there is a system to those piles), and I know what to do with it. Most of us have just figured out how to use those darn all-in-one copy machines and the thought of learning yet another way is just too daunting to even think about! In the same breath, we say we’re OK with change too, (as long as it’s associated with something like winning the lottery). We use electronic documents but don’t always mange them well. We have folder structures that go ten deep that made a lot of sense when we created them but are now the cause of carpel tunnel for all the clicks required to get to a single document. So, we save a document to our desktop where we know we can find it; except now our monitors have become mirrors of chaos that make us long for those paper file folders. In our infinite wisdom, we print those documents so that we can finally get to work on what started the search in the first place and for a single moment we feel a sense of control and inner peace. It’s no wonder digital data imaging is met with such resistance. Before we can really begin thinking about digital data imaging, electronic documents, and document scanning, we need to accept that there is a place for both paper and electronic documents and that the transition cannot be a quantum leap! This is not a “how to” series, but rather a new perspective on how we handle the paper vs electronic document conundrum. The battle will continue between the paper lovers and the digitally determined until we start to recognize what it is we’re all actually battling about. It’s possible that we can continue with forward progress and still allow for a transitional comfort zone. I think both teams get a bad rap. The IT group is under the gun to find new ways for information to be useful while the departments have a confidence issue and are so busy trying to get their work done that they don’t have time to adapt to new ways. I don’t want to get all “rainbows and puppy dogs” here, but at some point we need to figure out how to understand each other. I sit at the table with department managers, IT directors and C-suite executives and no one speaks the same language. The pressure to stay current and relevant is real, but we can’t ignore the core business functions or the people performing them because we risk that the journey to the clouds is going to be a bumpy ride. The good news is that the sun does shine above those clouds (I promise that’s the last sappy statement I’ll make). Trying to figure how to deal with all the paper of the past, the paper we still use, and the paper we don’t want to create anymore includes technology, outsourcing, financial, and change management considerations. Trying to ice out one of those aspects will either paralyze organizations from doing anything or at the minimum, ruffle enough feathers along the way to warrant resistance. Join me as we navigate through the world of digital data imaging and document scanning and talk about real world scenarios that include problem identification, understanding ROI, and managing changes along the way. A national financial services firm recently improved their customer service and created an efficient file management system by using color coded folders with RFID tracking tags. The firm works with dealers all over the nation to finance the purchase of vehicles from over 1,000 inventory sources, manufacturers, and wholesalers. They specialize in individual financing of new and used cars to dealers called floor planning. 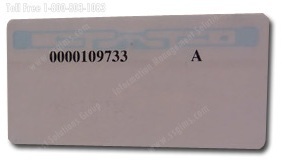 The financial services firm holds and files the titles as collateral in these loan transactions. 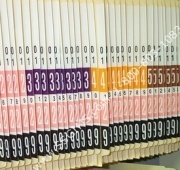 The titles are kept in file folders at a centralized records location. There is a large volume of titles constantly being checked in and checked out and managing this process is extremely difficult. The inability to locate title file folders when they are requested results in poor customer service to auto dealers, and inefficient file management operations for the financial services firm. The financial services firm turned to RFID to improve the speed and accuracy of the check-in and checkout process of title file folders. 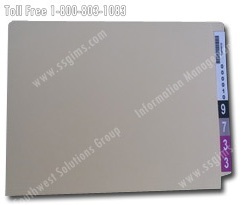 Pre-numbered color coded file folders with RFID tracking tags attached inside the folder were purchased to solve the problem. 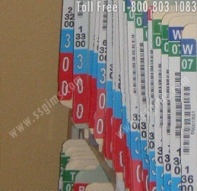 The color coded file folder labels assist in locating misplaced or misfiled folders, which has improved their efficiencies significantly. 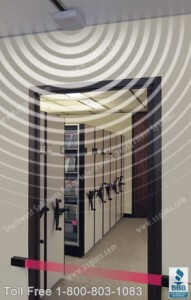 At the same time, the RFID tags automate the check-in and checkout file process by keeping track of where all the folders are at any given time and instantaneously updating their location in a database through the use of radio waves and an antenna receiver. 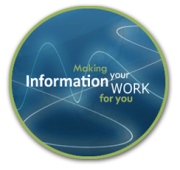 Southwest Solutions Group’s Information Management Division provides the experience and knowledge to help you with unique filing solutions for your business. Call us today at 1-800-803-1083 or send us an email to find out how color coded folders with RFID tracking tags will improve your filing process. Healthcare providers face many challenges including, protecting patient records, quickly retrieving information, and reducing administrative overhead. Also, the law requires physicians to maintain complete and accurate medical records for each of their patients, and a failure to maintain a record for each patient constitutes professional misconduct. Investing in an electronic medical records (EMR) system is an excellent way to ensure your healthcare facility will be able to provide efficient, coordinated, cost effective, safe and high-quality patient care. Electronic Medical Records allow doctors easy access to complete and up to date patient medical records. The EMR provides important information about medications the patients are taking, immunizations, and allergies, which a patient might not remember when they are filling out forms. Also, personnel can quickly update the records with any address changes or insurance changes. Electronic Medical Records save money. First, they save on the cost of paper and file folders. 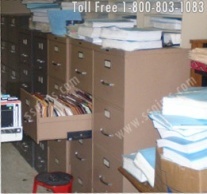 Second, an EMR system saves space because you no longer have to find areas to store and organize so many paper records. Finally, EMRs save on labor costs because employees can just type a few identifying keystrokes to retrieve a patient’s record instead of sorting through hundreds of file folders to retrieve and re-file a patient charts. Ready to Convert to an Electronic Medical Records System? Whether your business is a hospital, clinic or small private practice Southwest Solutions Group Information Management professionals can help you convert to an Electronic Medical Record System. We offer secure EMR-Compatible HIPAA compliant medical records and patient chart scanning services that are cost effective without sacrificing quality, service, or the privacy of your patients. If you want more information about EMR and our state of the art scanning services, call us at 1-800-803-1083 or send us an email.